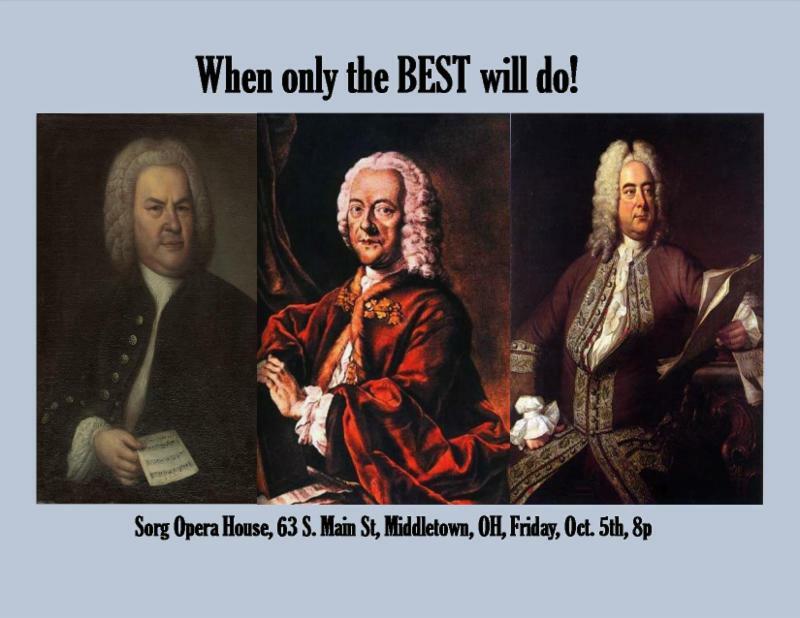 The Bach Ensemble of St. Thomas presents a concert of Baroque gems in the historic Sorg Opera House, 63 S. Main Street in Middletown, Ohio, on Friday, October 5 at 8:00 p.m. Proceeds from the concert will benefit the continuing restoration of the theater. Artists of the B.E.S.T., including soprano Alissa Ruth Suver, flutist Jennifer Parker, trumpeter Douglas Lindsay, and cellist Nathanial Chaitkin, will present a variety of pieces by the greatest names in baroque music. Music from Handel, Telemann, and the namesake of the Ensemble, J. S. Bach, will be presented in the Sorg, a theater whose superb acoustics has served as a cultural institution in Middletown for over 125 years. “Just like the Sorg,” notes B.E.S.T. Artistic Director Carlton Monroe, “the mission of the Bach Ensemble is to preserve the great artistic treasures of the past, and make them relevant to audiences today.” The Sorg's famed acoustics and jewel box seating will complete the experiences of a world class baroque concert. The first half of the program will include a concerto for trumpet, flute, and oboe by G. P. Telemann, arias for soprano and violin soloists by G. F. Handel, and J. S. Bach’s Trio Sonata for flute, violin, bassoon and harpsichord. The second half will feature selections from Bach’s cello suites, and the musical fireworks of Bach’s Cantata No. 51 for soprano, trumpet, and strings. Click here for reserved seats!